There is a young prospect in the class of 2013 by the name of Tyrone Outlaw and he resides about a 27 minute drive north of Cameron Indoor Stadium in a small southern town named Roxboro, North Carolina. Last season the 6-5 wing led Roxboro Person High deep into the state playoffs, "We went to the 3rd round of the state playoffs and that's unheard of around Person," Outlaw said with a glint in his eyes. 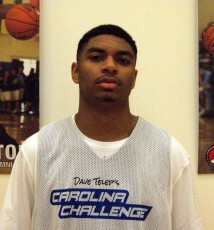 Outlaw participated in the Carolina Challenge event on Saturday where he averaged 9.7 ppg against the best players in the state of North Carolina. Outlaw told BDN that he was concentrating more on his overall game than his scoring at the event where players play about half of each game for their respective teams. During the summer AAU season, Outlaw will lace them up for Garner Road who most recently produced T.J. Warren who will be at N.C. State next season. When asked if he had a dream school growing up, Outlaw offered up N.C. State, where his father was to attend but fell short on his SAT's. His Godfather James Barnett played football for the Wolfpack. But it was another Triangle school that had Outlaw excited, that being Duke. "It's like a dream come true. I was in a workout and my coach called me and told me about a message on the phone which made me smile. It was Coach Capel. They've just recently called and want me to come over for a workout," said Outlaw. Outlaw was clearly happy that Duke was evaluating him and it remains to be seen if he will become a focal point for the program which currently has a lot of irons in the fire in recruiting. Outlaw who played center when he was younger and power forward is still adjusting to the perimeter. When asked what he needed to work on most, Outlaw said without hesitation, "Defense. I'm a great defensive player but you can never stop working on defense," as if the statement was scripted to impress a certain Hall of Fame Coach. Murray State called Outlaw this past week but it is Wake Forest that has it's foot firmly in the door. "They've talked to me and want me to play the two or three guard or a wing player. They want me to work on the little things, like screens, boxing out and keep my grades and character up. 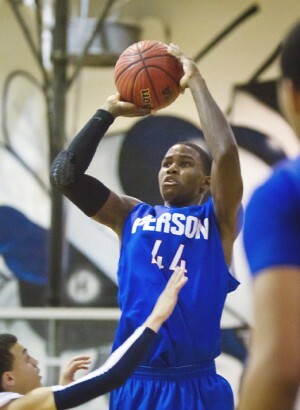 I am close with Coach Battle and he tells me what he wants from me and how it will be to be a Wake Forest Demon Deacon." Some consider Outlaw a bit of a secret, but schools will start to come in when they learn of his off season improvement, "I've improved a lot on my dribbling and on ball defense and moving but offensively I need to get better jab stepping and pump faking. I can knock down shots when I'm taking them but in a setting like this? I'm just worried about proving I can do all the other things." Outlaw likes the local or ACC schools and made it clear he didn't want to stray too far from the state. And with his fathers history of falling just short of college he seems to be fighting off those who may compare him. "My coaches and my mom Keep me straight. She keeps me grounded and if it was up to her she would want me to go to Harvard, Outlaw said in a light moment. Murray State and Wake Forest have promised to offer if his SAT scores line up according to Outlaw and considering he is currently in his schools honor society he stands a good chance of all coming out well. 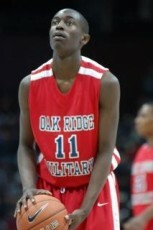 Theo Pinson is on the Duke radar. 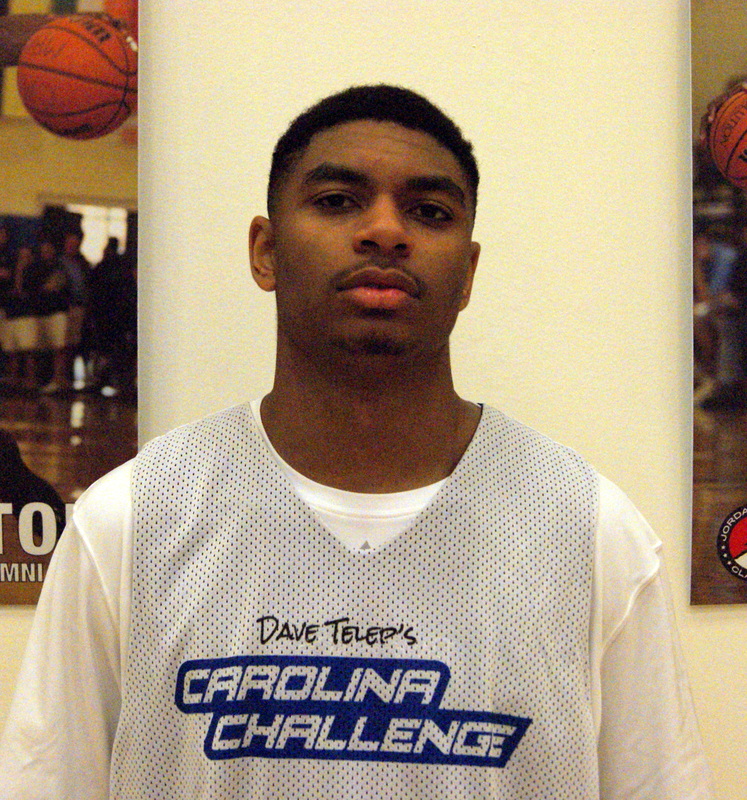 If you want to see some of the best young basketball players in the state of North Carolina, then you will want to check out the Carolina Challenge this Saturday. The event takes place in Cary and you can find a complete list of players and directions to the event in this Carolina Challenge Link. "The goal was to blend basketball with talking to kids about academics and life skills and packaging it all into one day," said Dave Telep who created the event which is in its third year of existence. 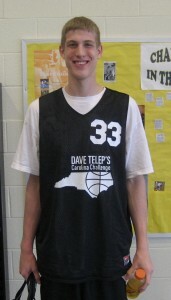 Telep is a respected analyst and scout, who is the head of basketball recruiting at Scout.com. He has now been a resident in the state for eleven years and has settled into the Triangle area. Telep's wife is from North Carolina and, as always, will be there to help out come Saturday. "My original vision of the challenge was to get the most recruitable kids in our state together in one place and bonk them over the head with academics," said Telep who has been known to take a vested interest in the prospects he follows. It's rare that an event takes the time to make a prospect realize how important academics are and to give some of them the opportunity to better their skills in the classroom and on the court. Last year's event featured John Wall, Ryan Kelly, Mason Plumlee and many others who are now household names to the many that follow AAU Basketball and recruiting. This year's event will be no different and those who attend will want to pay close attention to the kids in the class of 2011, many of whom are already rated in early national top 100 lists. "Devince Boykins (Class of 2011) from Rutherford played football and basketball and will now concentrate on basketball and by 6:00 Saturday, I'll bet our whole state knows about him," stated Telep. He continued, "The kids in our state are starting to take some ownership in the event. A number of guys who played in past challenges will come back and act as mentors." Other camp attendees will be UNC-bound Reggie Bullock of Rocky Mount and names like P.J. Hairston and C.J. Leslie, to name a few. Each player will participate in three games in just one day where they will be matched up against the best of the best. The event has been an eye-opener for some prospects in the past and this year should be no different. " In my travels over the last few years, I've learned a thing or two about what the college coaches are looking for," said Telep. He will share that knowledge in an effort to help these young prospects reach their full potential both on and off the court. Telep closed our conversation by saying, "I think the event is really unique. I'm not sure there is another state in the country during the spring or any time, that the top talent in the state are gathered under one roof to play in a setting like the Carolina Challenge. There are a lot of things I do with basketball that are a lot of fun, but there won't be another day like this Saturday where I will have more fun." Be sure to check out the event if you are in the area, for you will see a lot of future talent on display. Telep is giving back to North Carolina and it would be nice if the community turns out to support the event. The games tip off at 9:00. Did I mention that admission is "FREE?" See you there!